The Liang Tang tunnel project comprises a dual, two lane road tunnel linking the Sha Tau Kok Road and Fanling Highway interchanges in Hong Kong. The prime contractor is the Dragages Hong Kong – Bouygues joint venture. The 4.8 kilometre tunnel is through both soft soil and hard rock formations. The northern 500 metres consists of soft soil tunnelling using an earth pressure balanced TBM. Cross tunnels are being excavated between the two main tunnels. 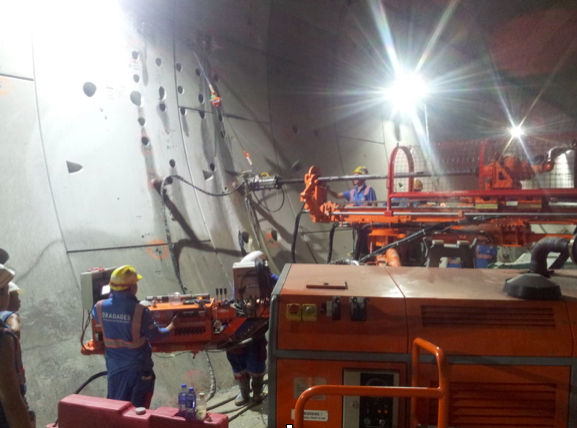 Sigra has provided specialist equipment to enable drilling and installation of the ground support and consolidation grouting so as to enable the cross tunnel excavation through the soft soils to proceed. The temporary ground support is installed through pre-drilled holes. Due to the nature of the formation and hydrostatic head acting on the tunnel and the risk of liquefaction, all drilling and installation work must be done under controlled conditions using borehole pressurisation equipment. prevent excessive pressure being developed within the hole so as to avoid problems with ground liquefaction. The equipment was required to be designed for the restricted access within the tunnel for the drilling rig, as the main passageway could not be blocked from other construction traffic. The design required three sealing modes. These were a lip seal during drilling; an annular blow out preventer (BOP) to shut in on non rotating drill pipe and a gate valve for extended shut in periods when the drill pipe was not in the hole. The system was also designed to take tube a manchette cementing pipes. The design balanced pressure was to be 50 – 250 kPa. The design is based upon Sigra’s well control system used in gas wells. The main difference being the shortened length and precise choke used to control back pressure in the hole and yet allow passage of particles up to 40 mm diameter. The system is currently successfully in use helping the contractor complete their cross tunnels.